The number of Shovellers is slowly increasing. I saw two males on Wednesday, five males and a female on Thursday, and seven males and a female today, slowly browsing their way up the Long Water and under the bridge into the Serpentine. 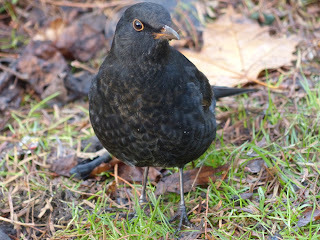 There are a lot of migrant Blackbirds in the park. This is a first-winter male who has not yet developed the yellow beak of a full adult. You can tell the migrants from the regulars. The regulars are found in their usual territories even outside the breeding season, and most of them are used to being fed by visitors -- yesterday when I was walking across a wide expanse of grass, one flew out of a tree 50 ft away and plonked himself down in front of me with an expectant air. The migrants are found all over the place and take little notice of people; they are neither afraid nor interested. 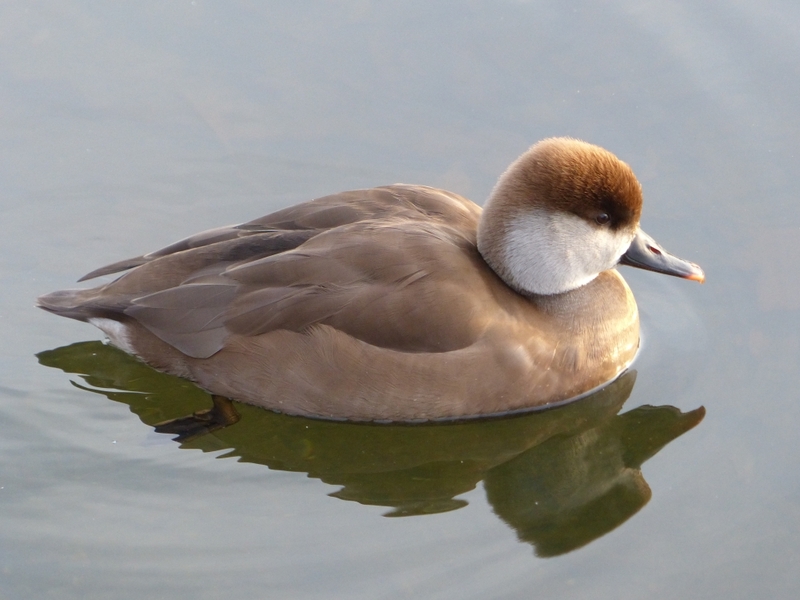 Here is a female Red Crested Pochard on the Serpentine: the plainest in colouring of all ducks, completely without the usual speckled plumage. But she is a very elegant cappuccino colour, with a smaller version of the male's fluffy crest and a discreet dab of lipstick on the tip of the bill (though the male looks as if he had used the whole stick -- see Tuesday's picture). 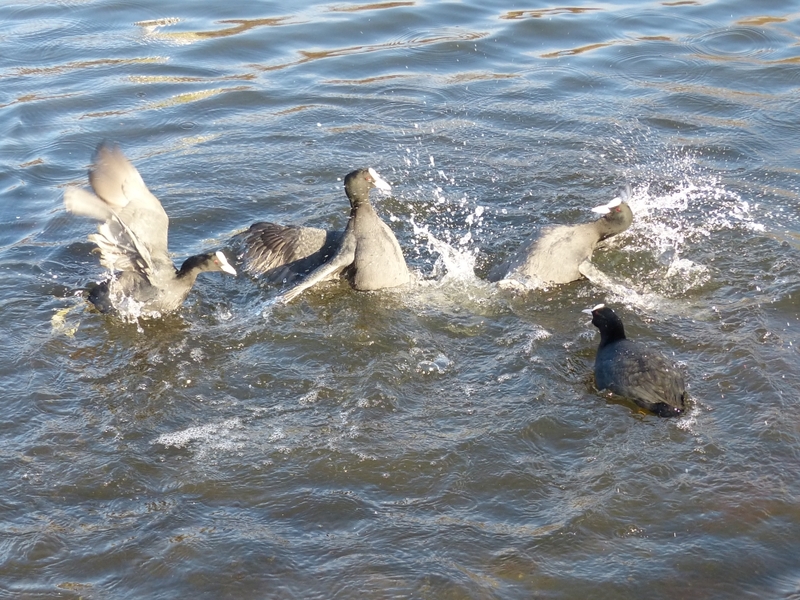 Two Coots were passing the time by having a fight, while their mates cheered them on and occasionally joined in. Their style is peculiar: they lean back in the water and kick each other with their large, strong feet. This seldom causes injury. There never seems to be a victory in these bouts either. 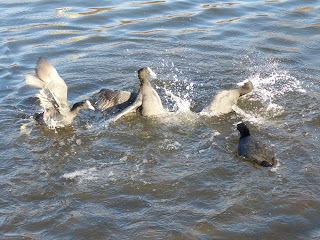 You often see a dominant coot chasing off a subordinate, but the kicking contests just subside after a bit, and they lower their wings that were raised in threat and carry on as if nothing had happened. A beautiful day, and some interesting gulls to see. This first-winter Black-Headed Gull is a visitor from Finland on its first trip abroad. Its ring says: ST294.731 MUSEUM ZOOLOG HELSINKI FINLAND. One of the regular ring observers has already noted its arrival, so it will go into the records. This gigantic creature is a first-winter Great Black-Backed Gull, the first I have ever seen. I noticed it because of its size, but had to go home and check that it was not a very large Lesser Black-Back or Herring Gull. 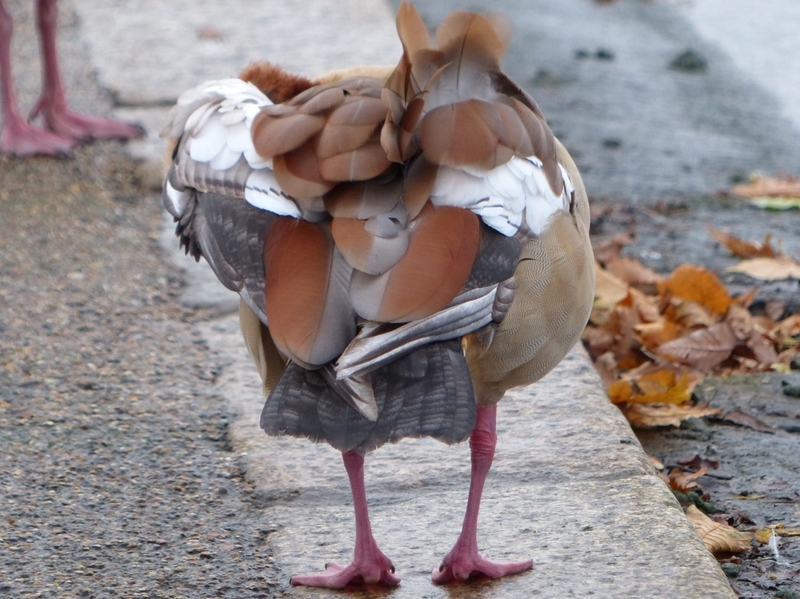 But I am pretty sure of this one: the B-shaped front edge to the darker feathers on its folded wings is distinctive. Great Black-Backed Gulls are serious predators and often take pigeons. If this one stays, it will join the resident Lesser Black-Backs in the hunt for the park's Feral Pigeons. 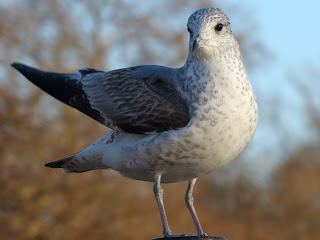 And here, to complete the set of young gulls, is a first-winter Common Gull. When adult they have pale grey backs like Black-Headed Gulls but are larger, with no black spot behind the eye and pale legs of a light greyish straw colour, and are easily spotted in flight by the white 'window' on their otherwise black wingtips. There are now quite a few of these winter visitors on the Serpentine. 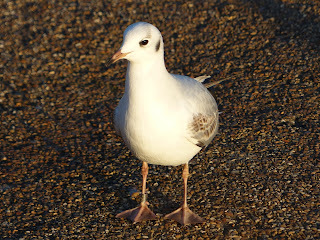 But they are not nearly as common as the Black-Headed Gulls. Sometimes you see them chasing the smaller gulls to take any food they are carrying, or whirling gracefully around in tight circles as they dispute the ownership of a bit of bread. 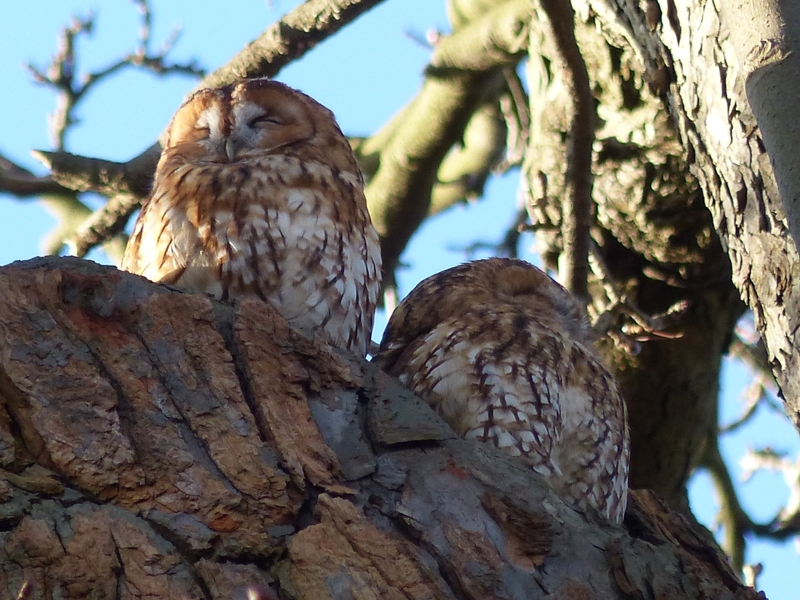 The pair of Tawny Owls were dozing peacefully side by side in the sunlight at the top of their nest tree. After the last few days' absence, two Shovellers showed up on the Long Water, both male, so they were not the pair from the Round Pond. A careful look all round the edge of the Long Water did not reveal any more, and there were none at the Serpentine island. 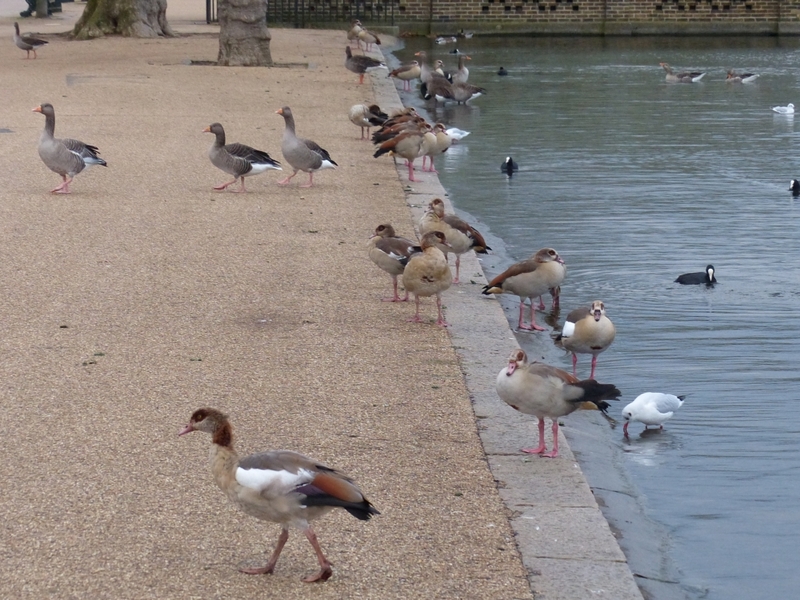 The north shore of the Serpentine from the bridge to the small boathouses has become the territory of the park's rapidly growing population of Egyptian Geese. There were at least 40 there today. It is a good place for them, especially on bleak winter days when there are few people with dogs. There is plenty of high-quality, freshly laid turf to provide food, pools of water to dabble in, and several temporary fences to discourage people from walking over the area. Nearby, two Greylag Geese were dozing while standing on one leg. They sleepily opened their eyes when I came over to take the picture, but they are all pretty calm about people who don't come too close. 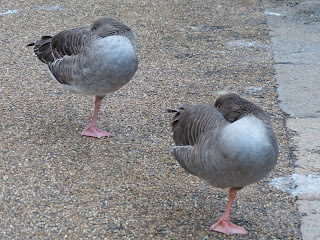 Their ability to balance while asleep is impressive, but not as uncanny as it seems, since birds sleep with one side of their brain at a time, and stand on the leg belonging to the waking side. 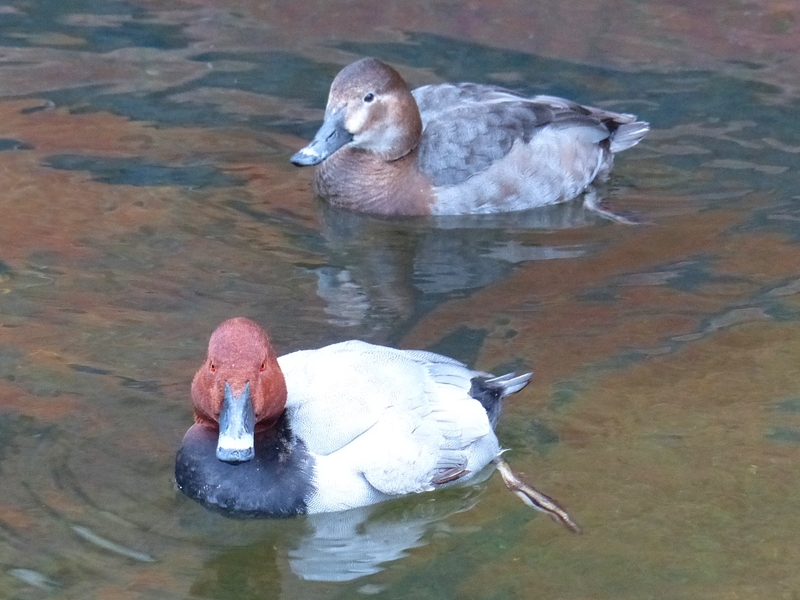 A few yards away, a pair of Pochards was cruising about. These small, quiet, modestly coloured diving ducks are easy to overlook among the park's gaudier species, but they are handsome birds. In both Common Pochards, as here, and in Red Crested Pochards, as in yesterday's picture, only the male has red eyes. 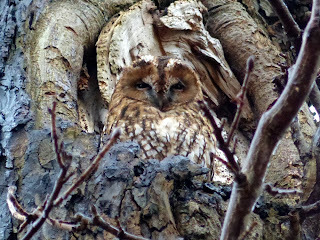 The male Tawny Owl was in his usual place on the tree where the pair nest. A Little Grebe was fishing under the willow tree near the Italian Gardens, above a decorative layer of fallen leaves showing through the shallow water. There are plenty of small creatures to be found by rooting around in the leaves. As far as I can see there are no Shovellers at all on the Long Water or Serpentine, which is quite unusual for the time of year. There are just two on the Round Pond. 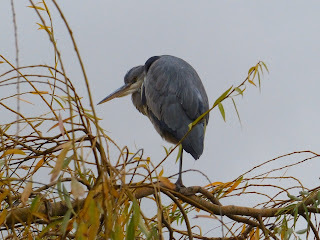 I looked from the bridge to see if any were lurking under the bushes on the edge of the Long Water where they have been before, but there was no sign of any. 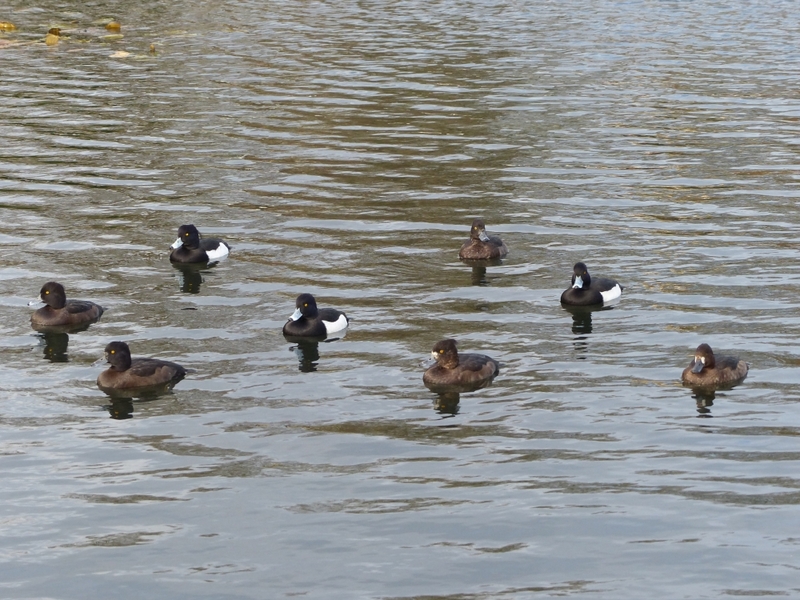 In contrast, there were 34 in Regent's Park on Sunday, reported in the London Bird Club Wiki. I wonder what is keeping them away from our park. Their numbers were low last year, but not as bad as this. 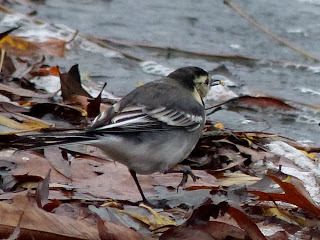 However, the Pied Wagtails, which had been missing from the edge of the Serpentine since the Olympics, have made a welcome return and you can often hear their cheerful flight song or see them running around looking for insects. 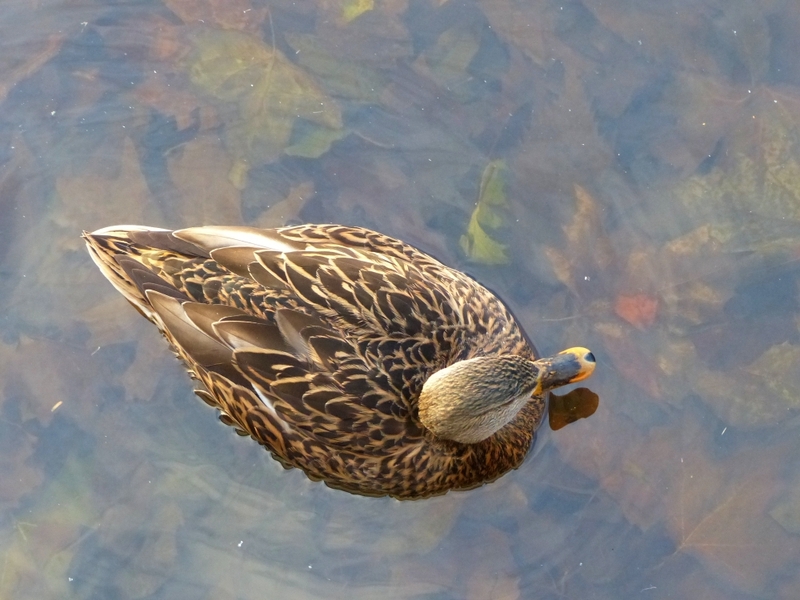 Here one of a pair has picked out an unidentified crawling object from the leaves at the edge of the water. 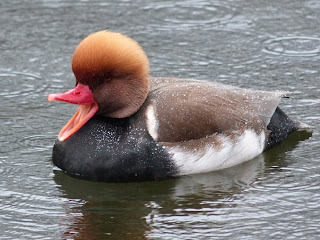 On a dark grey drizzly day, a Red Crested Pochard added a welcome splash of colour. There are two pairs near the Serpentine island. His high domed forehead gives him an intellectual air. However, it is nothing but fluff. In this picture he seems to be a little bored; not polite, as his mate was only feet away. 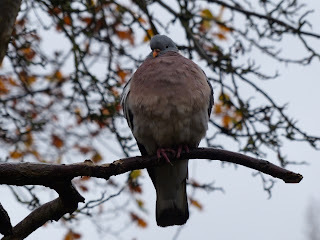 A bedraggled Wood Pigeon was waiting glumly for the rain to stop. It didn't. 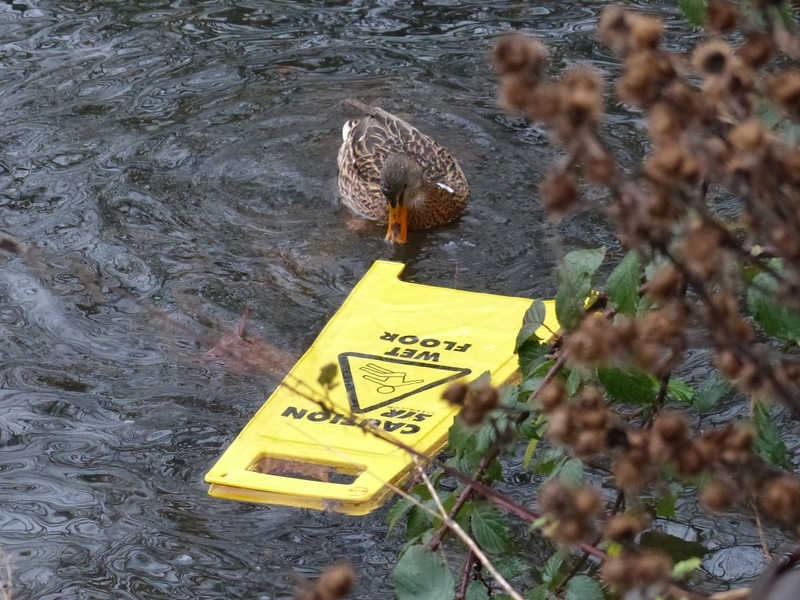 This Mallard read the warning notice, but evidently decided it didn't apply to her and paddled on. 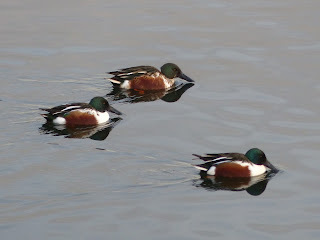 Time for the monthly bird count again. Two very low totals. The number of Feral Pigeons is less than half the normal population; I think that most of them were in the Winter Wonderland enclosure scavenging shamefully overpriced snacks. And there were only four Cormorants, all on the Long Water, compared to 40 last month. 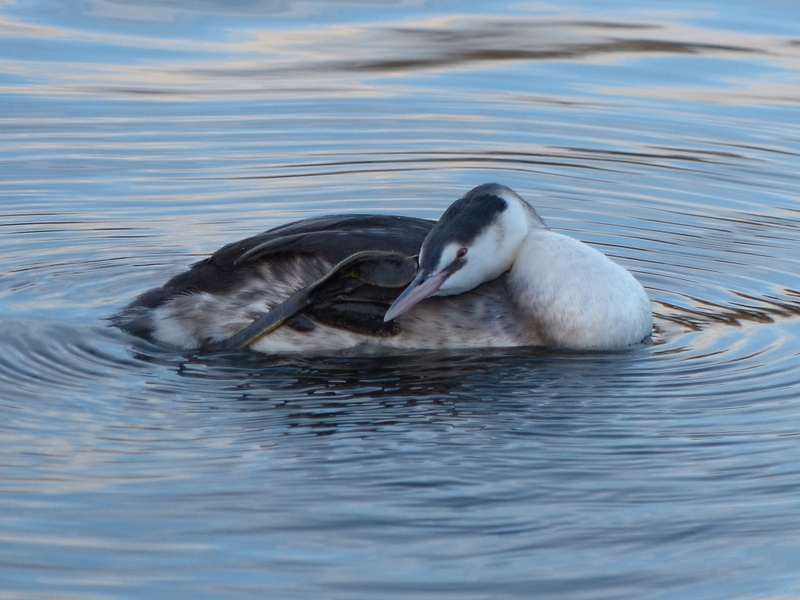 The number of Great Crested Grebes is down to 10 adults, from 16 last month. This confirms my belief that the Cormorants have eaten almost all the medium-sized fish. 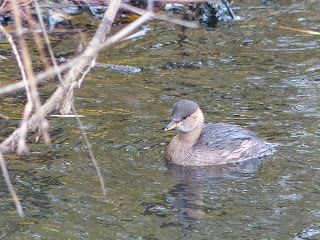 Again today, there was a Little Grebe under the willow tree near the bridge. I don't think the expansion of their fishing grounds has anything to do with the Cormorants. The small fish that Little Grebes eat would not interest Cormorants. I think they are just exploring. 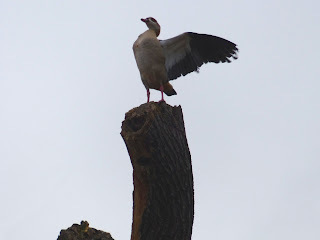 The pair of Egyptian Geese are still roving around the dead trees in Kensington Gardens. Here one of them strikes a heroic pose on top of the tree where Treecreepers nested earlier this year. It is not at all a suitable tree for the nest of a larger bird, as it has been cut down almost to a bare trunk, and the top is too narrow to build on. But the Egyptians' nest-seeking behaviour is not very well directed. I wonder what kind of trees they use for nests in their native North Africa. The female Tawny Owl was in her usual place on the side of the nest tree. 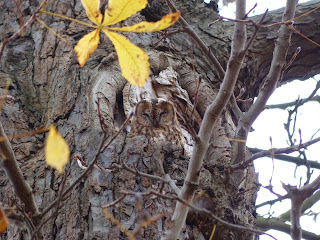 Paul reports that he saw a Little Owl in one of the usual sweet chestnut trees on Saturday, and this time it stayed in place long enough for him to take some photographs. Perhaps the Little Owls are calming down after the fright they had when children threw stones at them. The dark wet weather had kept most people out of the park, and there was only one person feeding the geese and swans on the Serpentine. So there was a wild rush from all over the lake to get what was offered. 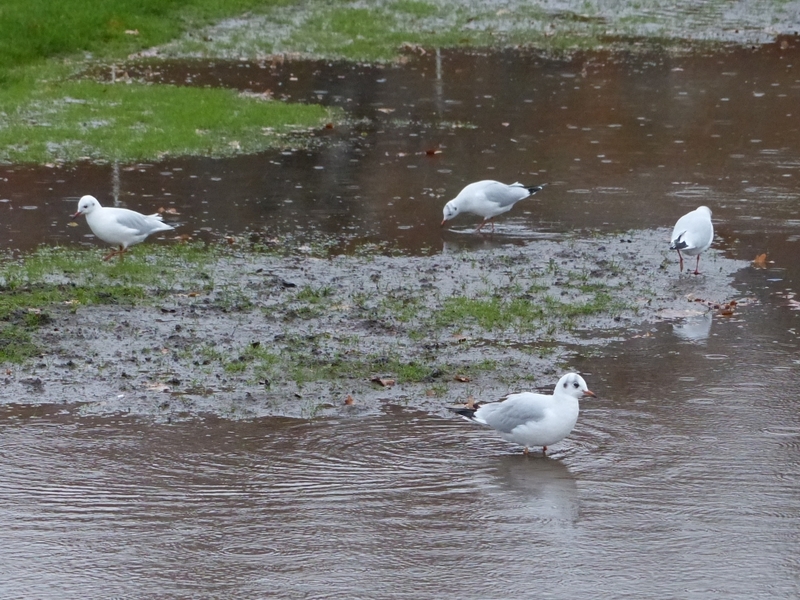 As usual, the Black-Headed Gulls were getting a lot of it. Their technique of hovering and seizing the food in midair is highly effective. Here three of them have caught pieces of brown bread, while the other birds have got nothing. A Grey Heron huddles up in the drizzle on a willow branch. 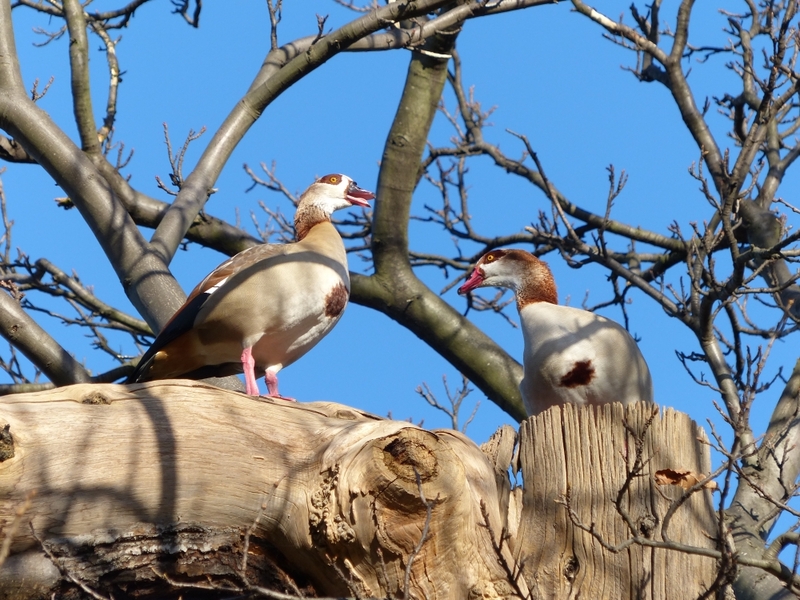 A pair of Egyptian Geese were standing on the broken top of a tree near the Serpentine Gallery, honking noisily. This is their ritual of selecting a place to nest. They fly to various trees and shout at each other until a consensus is reached. It doesn't matter how tall the tree is, as when their young are tipped out of it, the fluffy little birds will fall slowly to the ground unharmed. 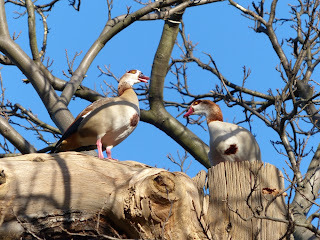 It is, of course, a completely inappropriate time for nesting, but Egyptian Geese come from a place where the seasons are different and they have little sense of what time of year it is in northwest Europe. 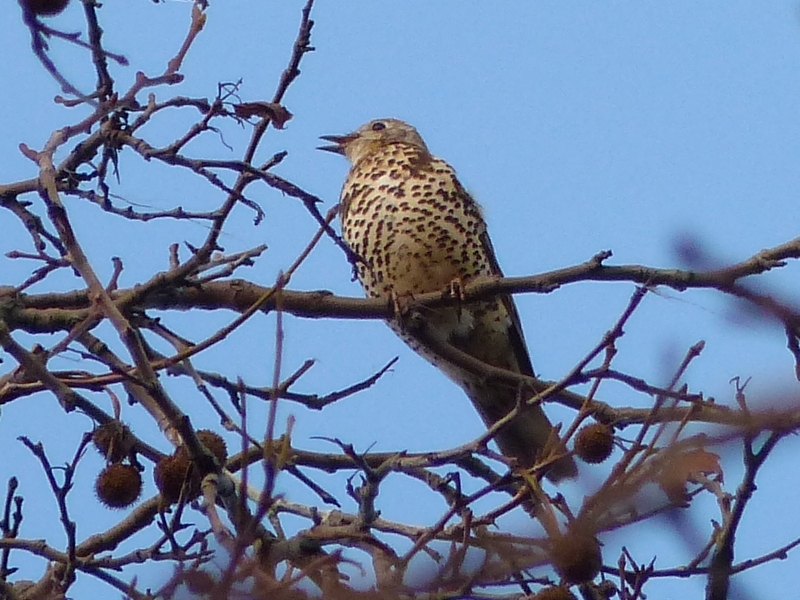 Nearby and equally out of season, a Mistle Thrush, perhaps misled by the sunshine, was singing at the top of a leafless plane tree. Their song, though melodious, is repetitive and rather boring. They have neither the silly enthusiasm of the Song Thrush nor the careful musicianship of the Blackbird. But it is very pleasing to hear them, and a reminder that winter won't last for ever. 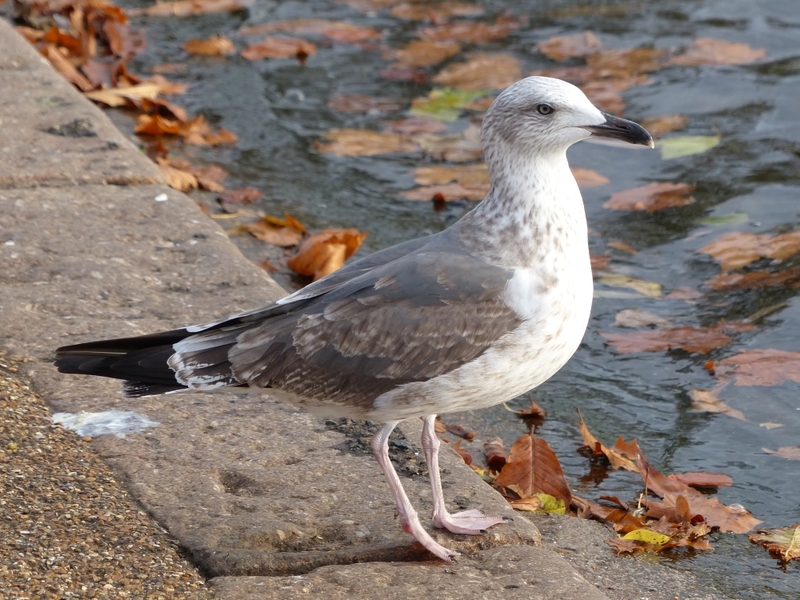 A slightly uncommon sight on the Serpentine: a second-winter Lesser Black-Backed Gull. For some reason nearly all the gulls of this species that we see here are either first-year or adult. This bird is at the beginning of its transition from tweedy first-year plumage to the slaty grey back it will have later. 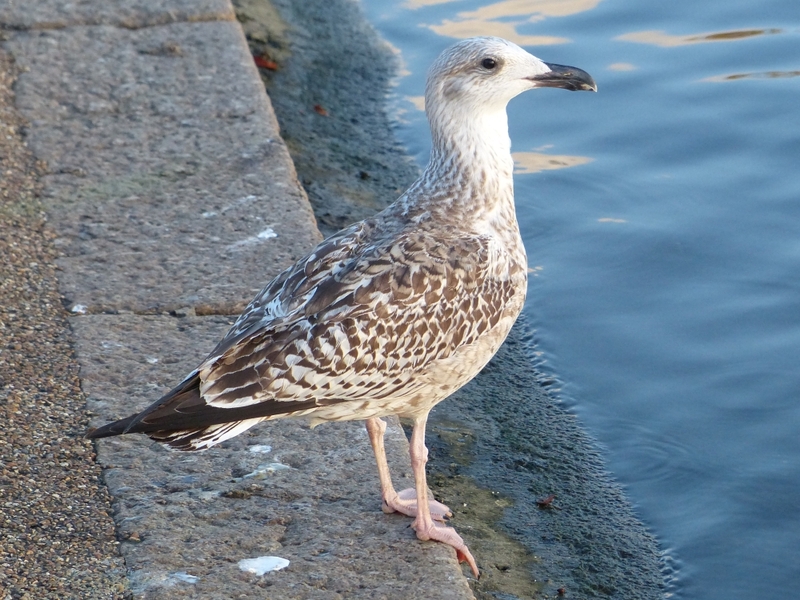 These large gulls take four years to get their full adult plumage. 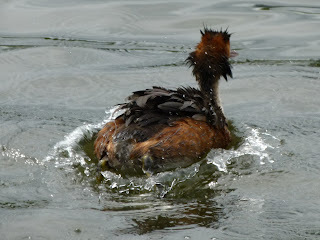 A Great Crested Grebe, in sober winter plumage, was scratching its head with a large foot. It has been raining almost non-stop since last night, and the area where the Olympic grandstand was is now a small lake. 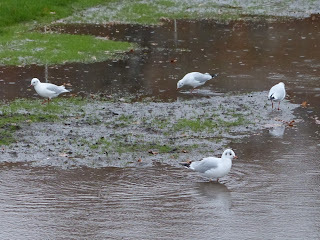 As usual, it is full of Black-Headed Gulls, which flock to flooded areas, probably looking for insects and other small creatures which have floated out of the grass. On the impervious London clay any area of flat ground will flood quickly. More remarkably, there are also floods on sloping land, for example on the Parade Ground at the east end of the park. Both these areas seem more prone to flooding than before, possibly because the crowds have compacted the soil. The floor of the Serpentine is made of clay which has been deliberately trampled to make it waterproof -- this is called 'puddled' clay. In the 18th century when the Serpentine and the early British canals were constructed, builders would call out the entire population of neighbouring villages to stamp on the clay for a few pence a day. 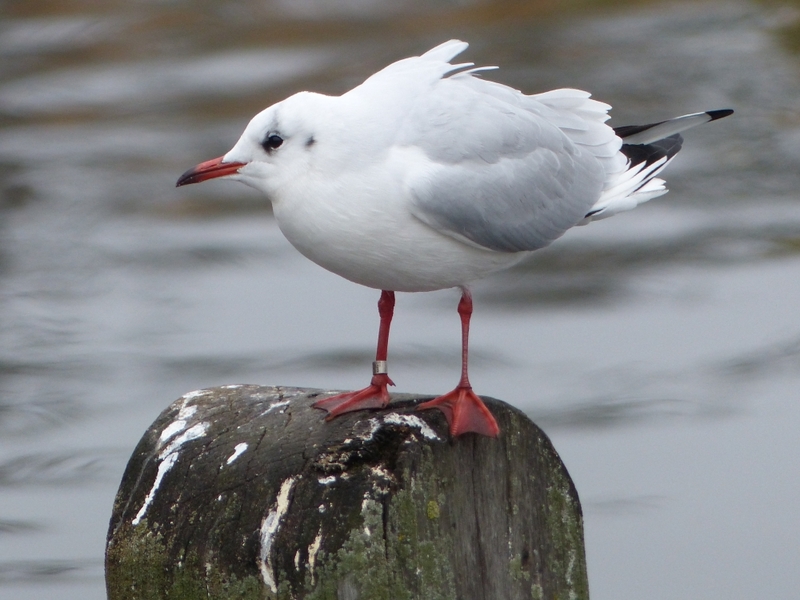 This Black-Headed Gull looks much like any other, but it has a ring, EY09813. The ring allows you to see that it always perches in the same place at the Vista, preferably on the same post. It was only ringed this January, so does not have much known history, but its deep red beak and legs show that it is several years old. Another ringed gull, EP24143, which favours a post to the left of this one, was ringed in Kensington Gardens in December 2002 and has been seen, always in Kensington Gardens, in the winters of 2005/6, 20006/7, 2010/11 and 2011/12, which shows these gulls' fidelity to their wintering grounds. The rain had driven the male Tawny Owl into his hollow tree, but his mate was sitting on her usual balcony, on the downwind side of the tree and sheltered from the rain by an overhang. 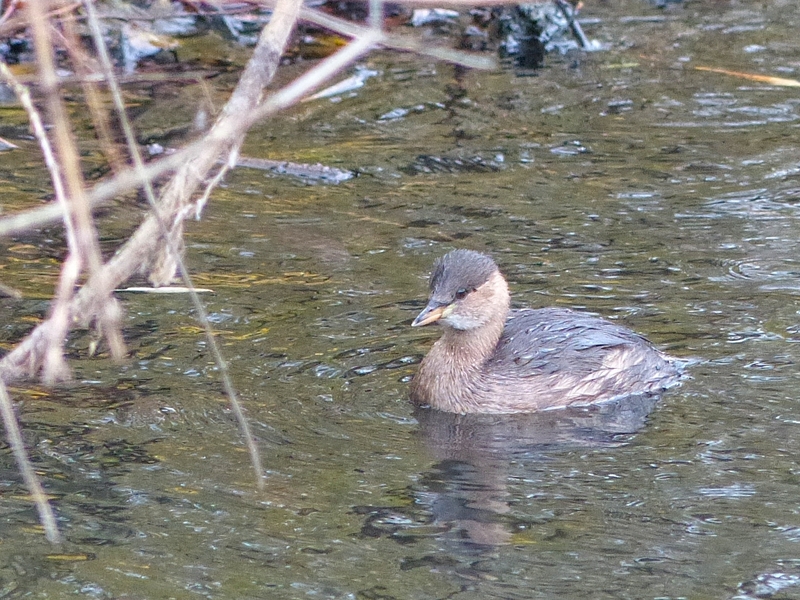 The Little Grebes on the Long Water have expanded their fishing grounds up to the bridge. In previous years they have sometimes gone the whole way to the Serpentine island, and you could see them briskly paddling along the open lake shore to reach it, looking very small and exposed but their ability to dive in hundredths of a second saves them from harm. 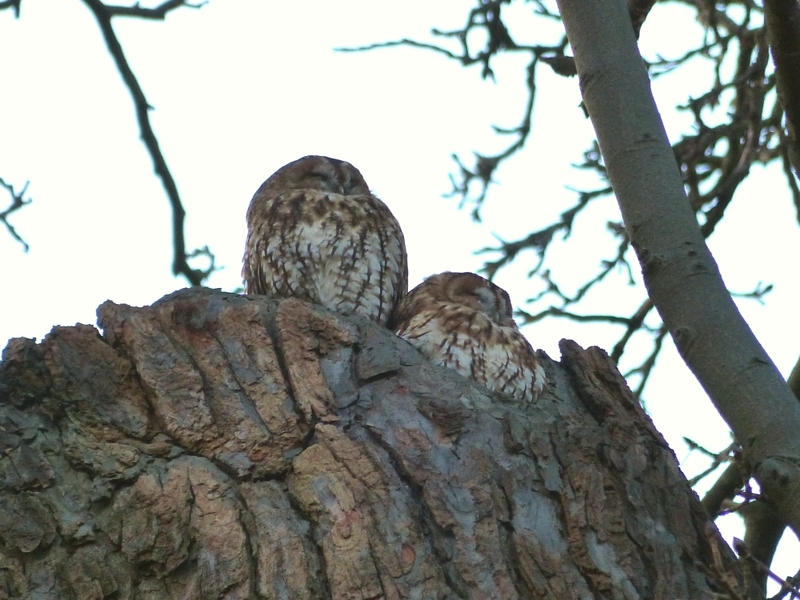 The Tawny Owls were in their usual tree, in separate places as usual. I took some routine pictures. But when I was going home just before sunset I passed the tree again, and the two of them were side by side on the top, where the male owl usually sits by himself. The female would have gone inside the tree from her customary perch and climbed up the the side of her mate. When I went passed they were still dozing and showed no sign of waking up for the evening's hunting, but it was getting so dark that I couldn't wait for a better picture. Beside the Round Pond, the six young Egyptian geese were settling down in a warm huddle for a night's rest. They are growing well, and with luck should be large enough to survive a cold winter. But just after I took this picture a stupid woman with a small dog off the leash went past, and it chased them back into the water. 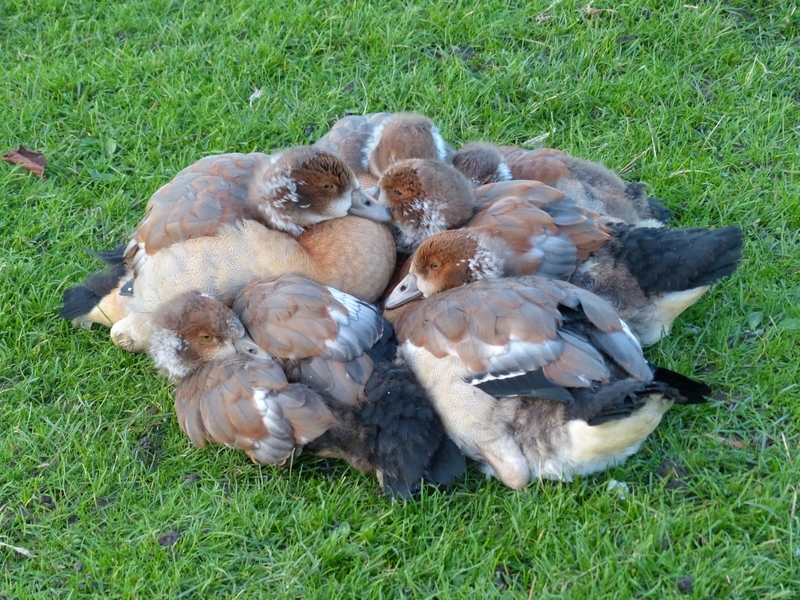 Dogs are required to be kept on leads near the Round Pond, as they have already killed many birds including swans. When I left, the Egyptians were just coming ashore to settle down again, and the park would soon be closed to give them some peace. On the Serpentine the brood of eight Egyptians, now almost fully grown, had come together again because one of the regular visitors was feeding them. They are unruly adolescents, and some of them were chasing each other. 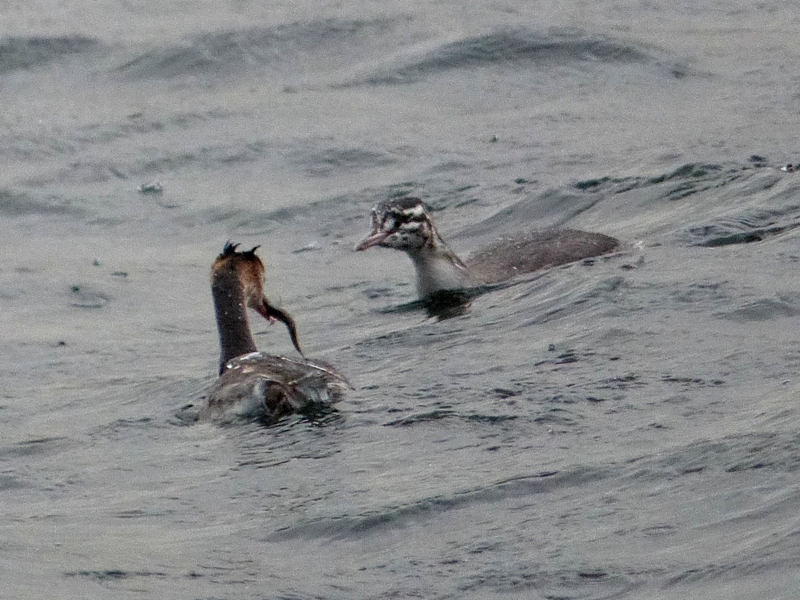 On the Long Water, a Little Grebe dives, watched by a hungry Black-Headed Gull waiting to seize its catch. 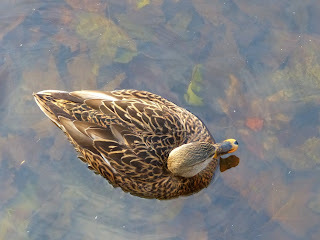 Here is a top view of a beautifully marked female Mallard swimming over autumn leaves. It was taken from the parapet at the outflow of the Serpentine, where the water is shallow. People often ask me to show them the Tawny Owls' nest tree. With tens of thousands of trees in the park, it can be a little hard to find. Here is the route from the nearest Tube station, Lancaster Gate on the Central Line. Coming out of the station, cross the Bayswater Road and enter the park by the gate immediately opposite, Marlborough Gate. 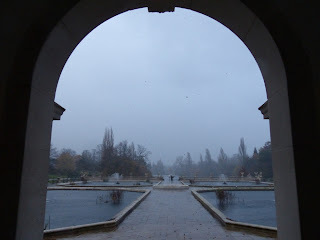 Once inside the park, turn 90° right and walk along the edge of the park till you get to the next gate (which is confusingly called Lancaster Gate). Here turn 90° left along the path. Soon you will see an obelisk on the left side of the path: it is a memorial to John Hanning Speke the explorer. Ahead of you, you will see the equestrian statue of Physical Energy. Walk along the path till you are equidistant between the obelisk and the statue. 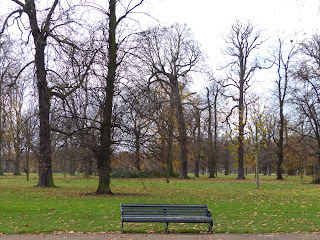 On your right -- the west side of the path, towards Kensington Palace -- you will see a bench. The nest tree is about 50 yards directly behind the bench, in the centre of this photograph. Note its distinctive broken trunk with a big branch sticking out to the left. The male owl's favourite perch is on top of the break in the trunk, where he is easy to see. The female owl's current favourite place is a little harder to find, especially as Tawny Owls are so well camouflaged when seen against tree trunks. She sits a little lower than the male, and on the right side of the trunk, in a place where a branch has broken off leaving a hole that leads into the hollow interior of the tree where there nest is. Here is a fairly long shot that shows this perch, with the owl looking out from it. It was a windy day, and the male owl had taken shelter inside the tree. 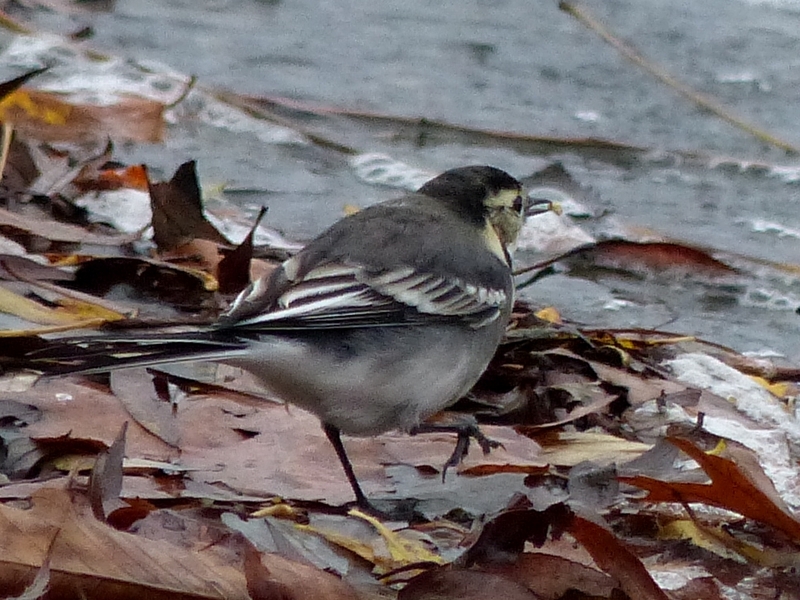 The small birds were also mostly staying in the lee of the bushes. 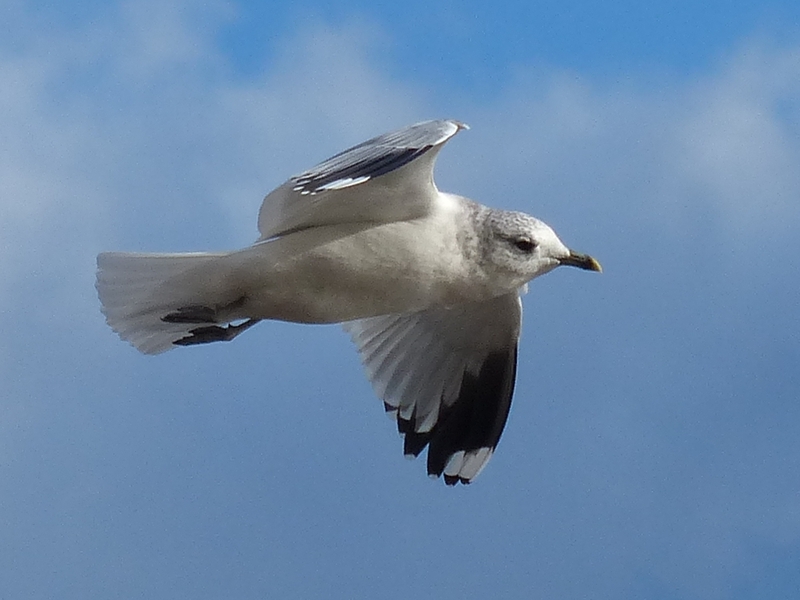 But gulls of all sizes were enjoying themselves in the gusts. Here is a Common Gull, with a clear view of the distinctive white 'windows' on its black wing tips. Although Common Gulls have pale yellowish legs, these look dark when they are folded up under the flying bird. 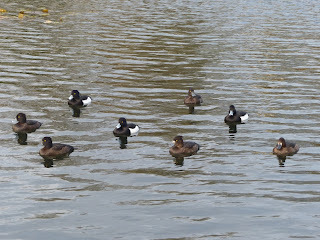 A small flotilla of Tufted Ducks has taken up residence on one of the ponds in the Italian Garden. It seems rather an exposed place with little to recommend it, but they have been here for days, always in the same one of the four ponds. A proper English November day: rain and wind. Here is a bleak view from the loggia in the Italian Garden. There were a lot of migrant Blackbirds in Kensington Gardens, in addition to the residents. I saw 17 when I was walking quickly around the Long Water. 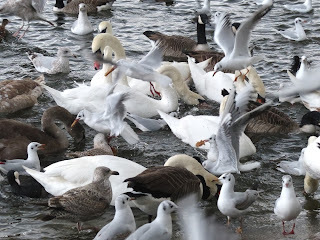 The number of Lesser Black-Backed Gulls on the Serpentine is also higher than usual. Here is one of them eating a fish that it has got somehow. 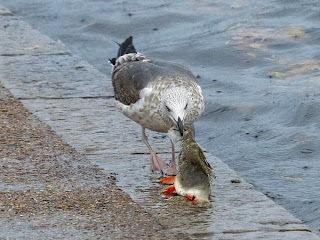 I have never seen a gull snatching a fish from a Cormorant, but I am sure they are more than capable of it. 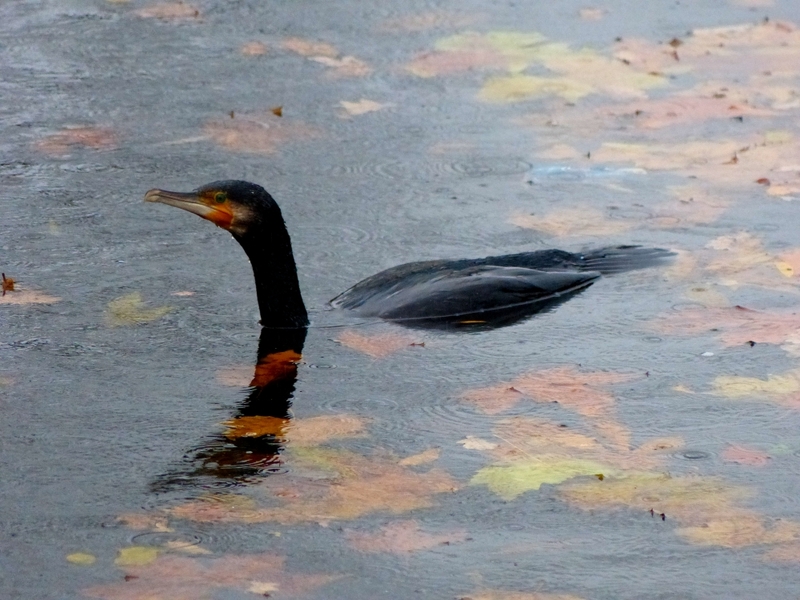 At the top of the Long Water, undisturbed by gulls, a Cormorant was fishing among patches of dead leaves. It dived repeatedly without finding anything in what is usually a good place. It does seem that the Cormorants have finally exhausted the stocks on the Long Water. There were certainly fewer of them than usual. When the supply of fish is low, word gets around the colony of Cormorants on the Thames, and they don't bother to fly up to the lake. 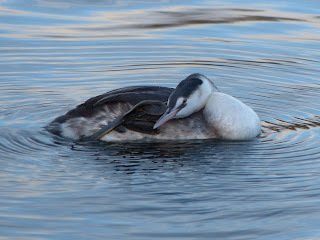 I was wrong yesterday about all the Great Crested Grebes having left the Long Water. The family with three young ones from the nest on the fallen poplar tree were visible again in their usual territory, the first time I have seen them for several days. They were probably on the west side of the lake, which is hard to view. The family with four have not been seen for about a fortnight, and I am sure they have left. 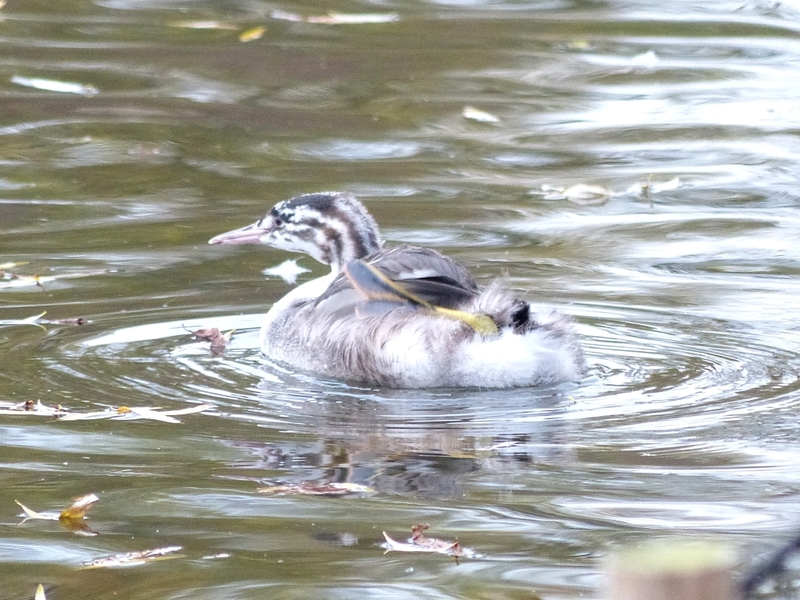 At the far end of the Serpentine the wind had raised some quite choppy waves, but it was business as usual for the youngest Great Crested Grebe and its doting parents. Here the young one slides down a wave to take a fish. The young bird was also actively hunting for fish by itself. It will be independent in a few weeks, and should be able to fly before the freezing weather arrives. It hatched in the first week of September, really the last possible moment that would have allowed it to survive. Both families of Great Crested Grebes have left the Long Water in the last few days, and I think the childless couple went with them. All their young had long been able to fly. Maybe they left because the Cormorants had eaten their way through most of the medium-sized fish. Maybe they sensed that the weather was getting colder, and left to avoid being frozen in -- this can be a bad problem for Great Crested Grebes with their need for a 50 yard take-off run, and they are wary of the threat of ice. They don't migrate, they just move around to what they consider suitable places. It is not clear where they go when they leave the lake, but I think it is probably the Thames somewhere upstream of Chiswick, where the current prevents the water from freezing and there are plenty of weedy backwaters where they can hang around without having to constantly swim against the strong current. In very severe weather they have been known to go to sea, where they can live perfectly well. Their ability to live in salt water explains why Great Crested Grebes are found all over the temperate zone of the Old World; they have even reached New Zealand. The Little Grebe, a less seaworthy bird, is found only as far as 'Wallace's Line', the big gap in the East Indies to the east of Borneo that divides Asian and Australasian species. East of the line it is replaced by a near relative, the Australasian Grebe Tachybaptus novaehollandiae, which looks very similar but has yellow eyes. 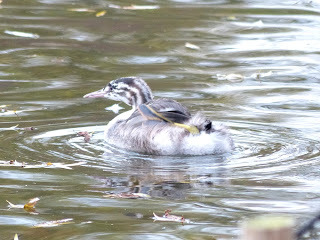 Anyway, the Great Crested Grebes have given us a fine show this year, and there are still some on the Serpentine. 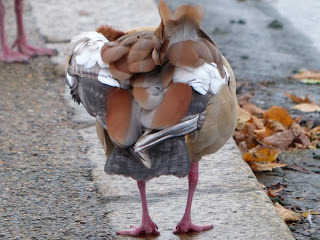 Speaking of birds looking ruffled, here is a female Egyptian Goose who was caught by a sudden gust while preening herself. 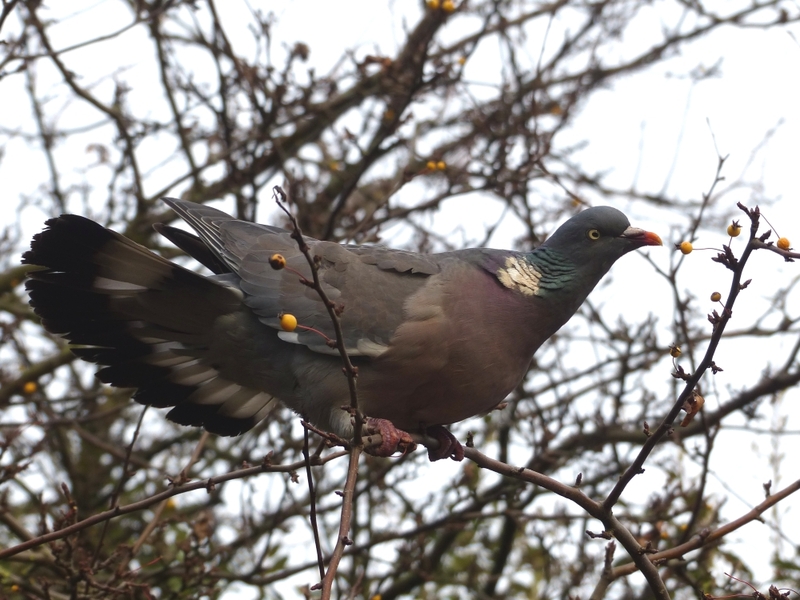 A Wood Pigeon struggles to keep its balance while reaching for a berry. They flap heavily in and out of the bushes, constantly beating their wings against the twigs. It is surprising that their feathers aren't in shreds. And here is a Grey Wagtail coming down to the water's edge in its perennial search for small insects. 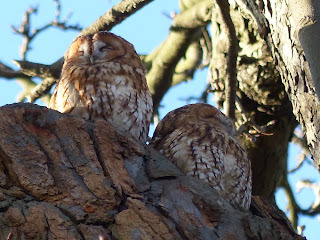 The Tawny Owls had returned to the beech tree, and were clearly visible though not perfectly placed for a picture. The pair were sitting close together. They are beginning to take more notice of each other as the breeding season approaches. 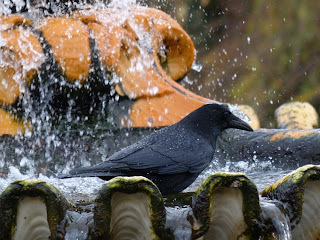 A Carrion Crow was having a bath in the marble fountain in the Italian Gardens. This basin combines the features of a shower and a jacuzzi, and might have been designed as a bird bath. Sadly, the other bathing place, right at the other end of the lake at the top of the waterfall in the Dell, has been ruined by gardeners ripping out the berberis and cotoneaster bushes that were inhabited by Goldcrests, and gave many small birds shelter when they came out for a bath and a drink. It is now bare and open and provides no cover at all. Also at the bottom end of the Serpentine, the youngest Great Crested Grebe was unfolding a yellow-edged leg from under its wing. It is remarkable how compactly grebes' long legs can fold up. Little Grebes, which have even longer legs in relation to their size, have to add one more fold by turning their feet backwards. All grebes find that their legs get stiff and cramped in this position, and you often see them stretching their legs out straight to ease them. 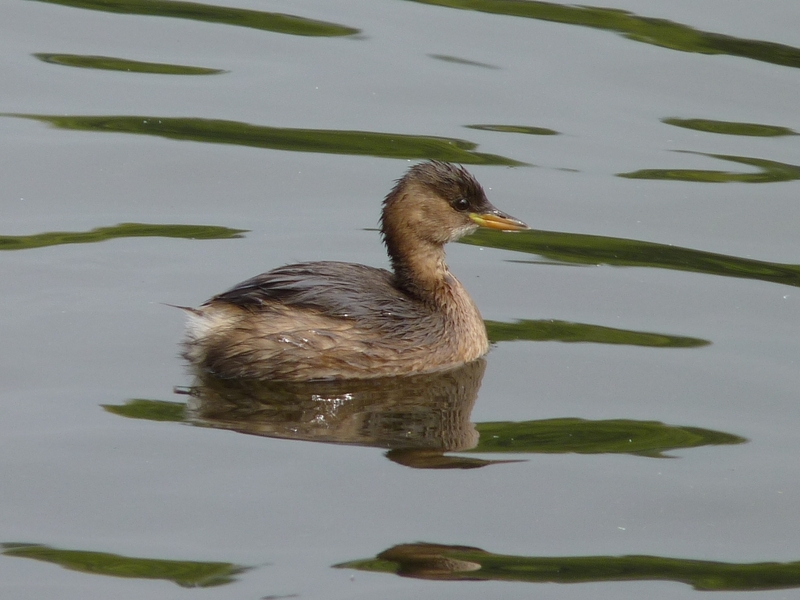 Grebes' legs are so highly adapted for swimming that the bones are flattened. This both makes the leg more streamlined as it cuts through the water, and gives it extra strength along the axis of the slashing sideways swimming stroke that gives its individually lobed toes the effect of turbine blades. This adaptation has occurred twice. The first bird to evolve similar legs and feet was Hesperornis, a seabird of the Cretaceous era that flourished 80 million years ago. 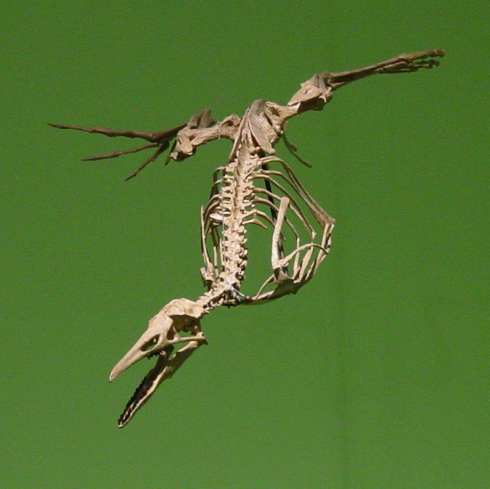 It was bigger than any grebe and flightless, and seems to have had a similar way of life to modern penguins. This skeleton is of the largest species, H. regalis, which was 6 ft long. 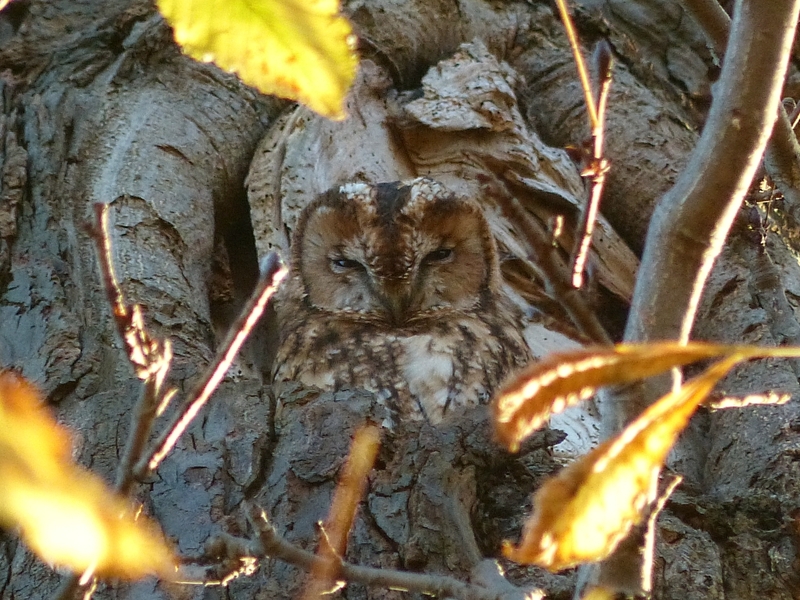 The female Tawny Owl was in her lookout in the nest tree, gazing severely at me with her deep brown eyes. 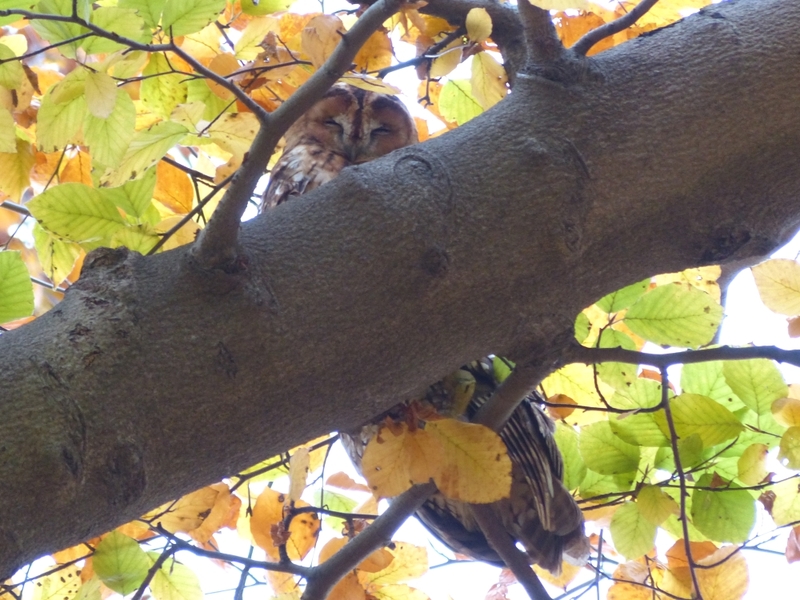 She is now as much of a regular in this place as the male owl is in his throne on top of the broken trunk. 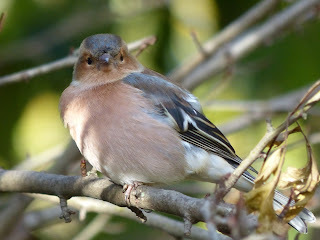 This male Chaffinch was looking at me for a different reason: he was expecting to be fed. 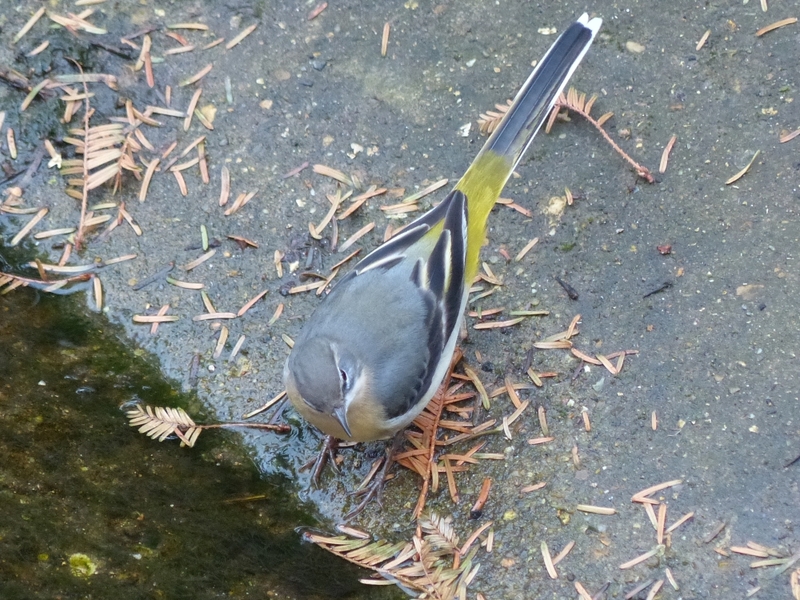 Immediately after I took the picture he flew down for a meal of pine nuts and sunflower kernels. 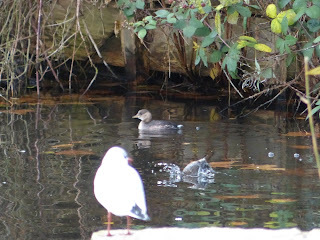 On the Long Water, the Little Grebes were being pestered severely by Black-Headed Gulls, which sat on the water around them waiting for them to surface with a fish they could try to seize. The Little Grebes sensibly moved under a bush and continued fishing where the gulls couldn't reach them. 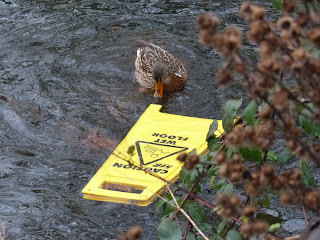 They are actually fairly well protected against gulls, because their amazingly fast dive is quicker than a gull's lunge. Their generic name Tachybaptus means 'fast diver'. 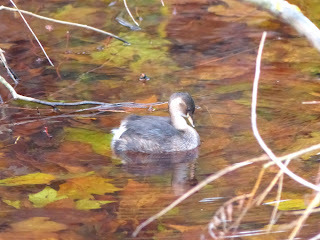 With practice, you can tell when a Little Grebe is about to dive. 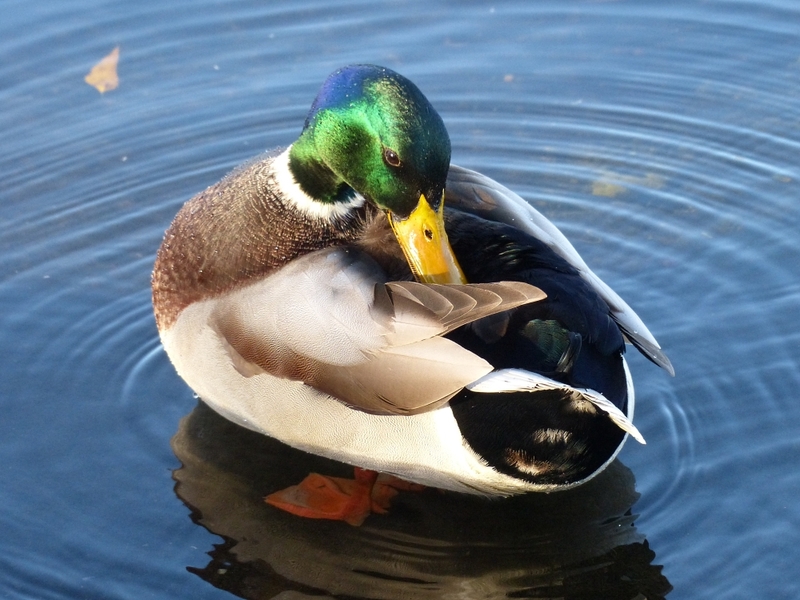 A fraction of a second before, it clenches down its feathers to make itself more streamlined under water. This is easier to see in winter, when the surfaced bird fluffs itself up to an almost hemispherical shape to keep itself warm. Several rabbits were out on the Vista enjoying the warmth of the sun. 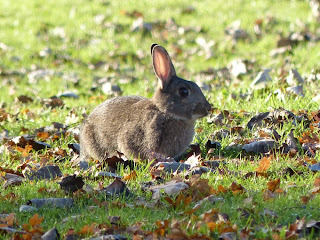 It will be interesting to see whether the myxomatosis that has kept their numbers down has finally burnt itself out. A big old rabbit suffering from the disease was seen earlier this year. But now that their numbers are increasing, there is reason to hope. The foxes are probably hoping for the same thing. Mallards are so common that it is easy to forget the splendour of their plumage, until you see a male with his iridescent green and blue head catching the sunlight at just the right angle.